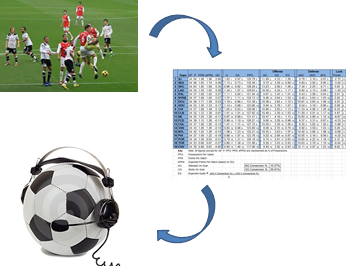 Sports reporting system is a natural language generation system that surveys a match (soccer, baseball, and basketball, etc.) from a match table. The system collects data to analyze from table, and it generates triples. Triples are sorted by importance, and the system generates appropriate utterance templates for the triples. After aggregate similar sentences to make sentences readable easily, referring expressions are generated to make transition softly. Final result is a survey of the match in natural language. The application could be useful to review the match for the users who love sports.